In Norway, we fill this cake often with, raspberry jam, homemade vanilla cream, and a light not-over-the-top too sweet whipped cream, and layers filled with fresh fruit, like strawberries, raspberries, and bananas. Norwegian often, add some orange juice to the cake layers before you add the filling to moisten the cake more. This sponge cake is made without any →baking powder or →baking soda, it gets its rise from whipping the eggs triple in volume, and combining the dry ingredients gently. If you feel you get a better rise from baking powder you can use →1/4 tsp. baking powder for each egg, it is not necessary for this recipe I don’t use baking powder but I know a lot of you have a problem getting a rise; that said, if you are not carefully blending in the dry ingredients even when you use baking powder you won’t get a rise anyway, read my Notes below! 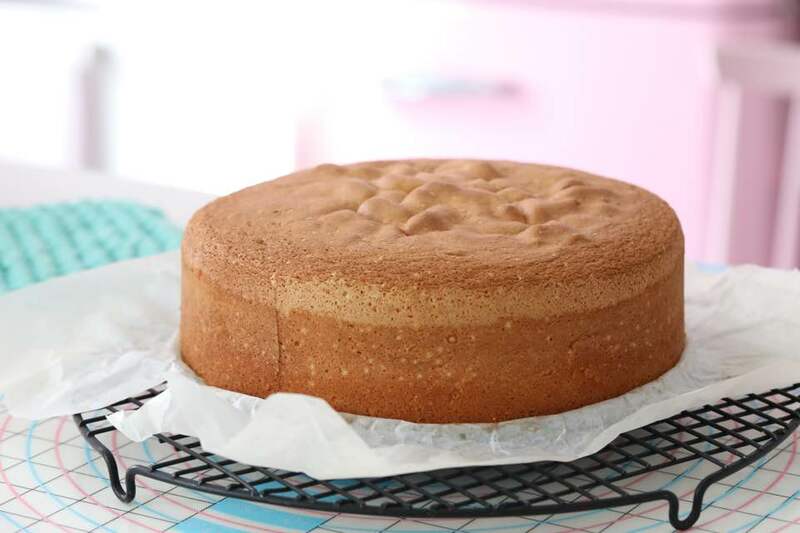 If your cake does not rise probably; make sure that you combine the flour by hand and not with a mixer, as you will knock the air out of the cake, and it won´t rise in the oven. Also never open the oven door for at least 20 minutes, as your cake will fall, and become flat. If your cake sinks in the middle, you probably have baked it to little, each oven is so different so always check with a cake tester. *NEED TO CONVERT GRAMS INTO CUPS; USE THIS CONVERTER. Preheat oven to 350°F (180°C). Grease the bottom of three 8– inch (20 cm) round cake pans and line with parchment paper; Or if you prefer you can use an 8-inch spring-form pan line bottom with parchment paper and spray. In a medium bowl, sift the flour and cornstarch or if you use potato starch, and set aside. In the bowl of a standing mixer, fitted with the whisk attachment, beat the eggs and sugar on low-medium speed for 1 minute. Increase the speed to medium, and continue beating for 5 minutes. Add water or buttermilk and beat for another 1-5 minutes on medium-high speed. Add vanilla bean paste, and beat for one minute more. The batter should be very thick. When the whisk is lifted, the batter should ribbon from it back into the batter in the bowl. Pour the batter into a large wide bowl. Sift in half the flour mixture. Use a large silicone spatula to stir and fold until only a few streaks of flour are visible. it is important to not deflate the batter. Pour the batter into the prepared pan or pans using a spatula to distribute batter evenly. Let the cakes cool in the pan on wire racks for 10 minutes. 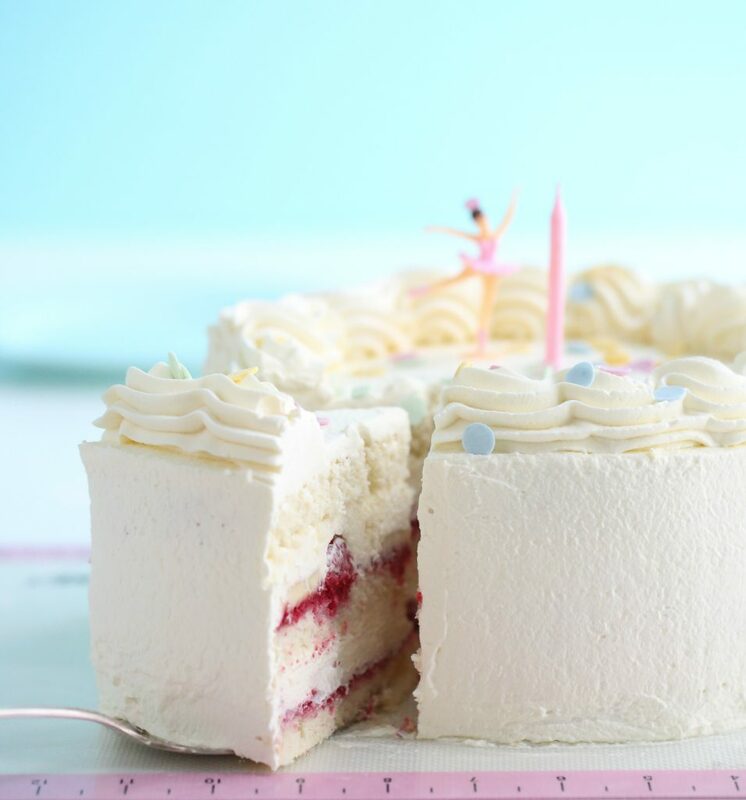 Use a knife to loosen the sides of the cakes and carefully turn them onto wire racks. Peel off the parchment paper and let cool completely. If you baked this cake in one springform, Cut the cake into 3 even layers and fill the cake with anything you love. LOTS MORE RECIPE LIKE THESE YOU CAN FIND IN MY ENGLISH BAKING BOOK. 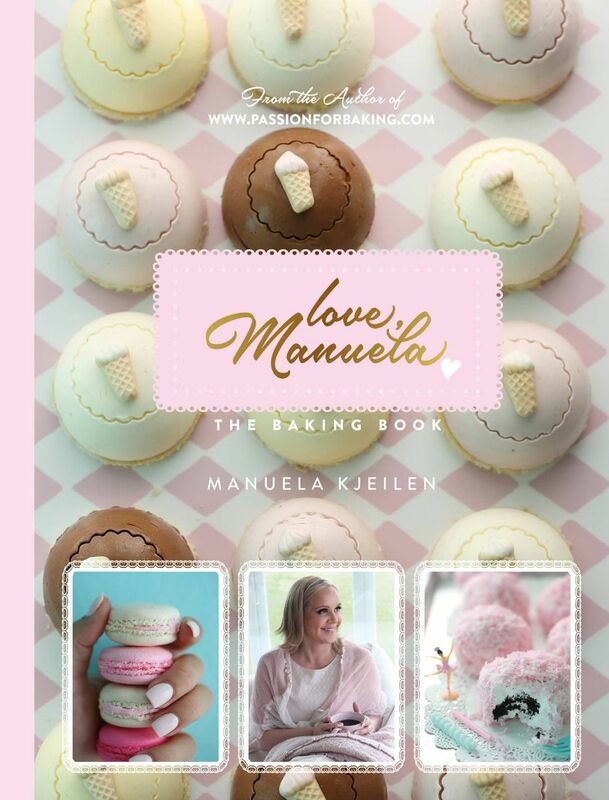 LOVE MANUELA THE BAKING BOOK. HAVE A BEAUTIFUL DAY YOU ALL AND CHECK BACK SOON FOR MORE DELICIOUS RECIPES. Looks yummy! Might have to surprise my sister, Michele Mehlen, or the boys next time they come visit us from Norway! 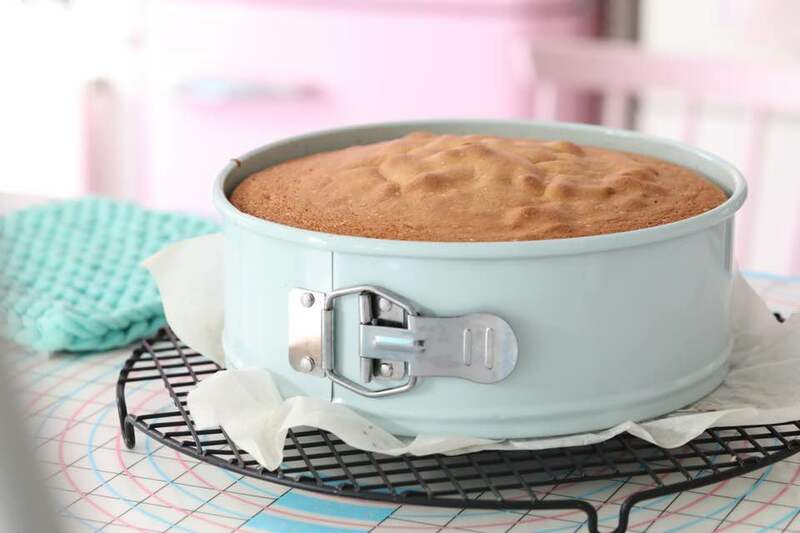 With this cake, if baking in 3 tins, 2 on middle shelf, the 3rd tin on a lower shelf? And if it doesnt bake in same amount of time, is it best to move it up to middle shelf when i take the other tins out, or allow it to continue baking on the lower shelf? hi Aneesa, all my cakes if not written otherwise, are baked in the middle of the oven, so you need to bake 2 first and then the other,! I absolutely adore your recipes, they are fabulous! Could you please, kindly confirm the amount of cornstarch required when baking three separate sponges, as your recipe above states: 8+? Hi Terri Sift the CORN STARCH, OR POTATO STARCH, if you are using that! I usually use potato starch in this recipe, but put maizena today by mistake. Someone told me that the result will be a dry cake, is that true? And how can I fix that? This cake is really important!! Have your tried both starch, and have you noticed difference? Your expert opinion may calm me down. Looking forward to your answer!!! Which recipe do I use for the mini cakes? 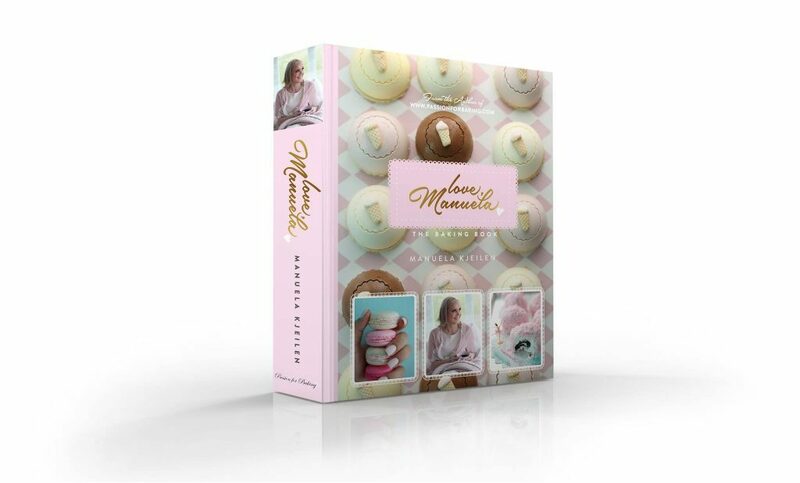 I so want to try the mini princess cakes! So beautiful!! Hi Manuela! This looks great! Can I make this into a chocolate cake? Would I just add cocoa powder? And substitute some of the buttermilk for coffee? Do you know what I would have to cut out for the cocoa? Sugar? Would this cake be ok if it’s kept the fridge/freezer, or would it affect it’s texture at all when it’s thawed? Hi Manuela, am a new fan, I adore everything, from your color scheme, all your utensils to your kitchen, and Equipment,to recipes …everything. Now, if am not using vanilla paste, how much vanilla extract should I use? Thanks, I shop from all over the world, use 1 teaspoon vanilla extract or vanilla sugar! I would like to know how long this cake stays fresh for? And can I make this cake 2 days before it is eaten? 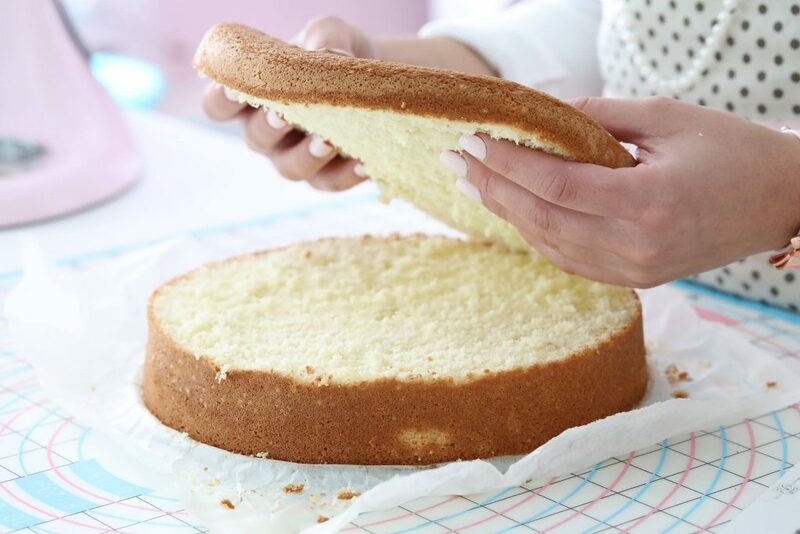 I want to make a higher cake with 4 layers of cake. Can I use a smaller form (20-22 cm) and then cut it in 4 pieces, would it still still nice? And should I still bake it in one piece or make 2 separate sponges? And then cut them in 2. I am afraid that the dough will be raw in the middle if it’s too high and baked in 1 piece. Thanks a lot!